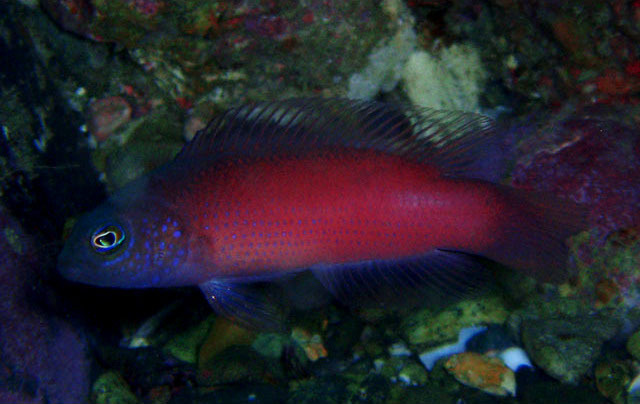 There’s a lot to like about the Dottybelly Dottyback, a new species of Pseudochromis with a delightfully alliterative name that was just described from Japan. With its blue speckled facial markings and a warm ruddy glow that seems to burn from within, this is definitely one of the more colorful species to be described in recent years. 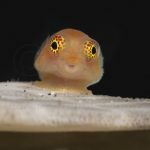 In total, there are some 71 taxa now recognized in this genus, including familiar aquarium fishes like the Orchid and Sunrise Dottybacks, along with many other lesser-known species that come in various shades of drab and dull. 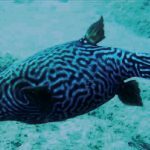 This new fish has been reported by Japanese divers for quite some time now, but it was only thanks to the efforts of Kimihiro Yamasaki, a diver who had previously photographed this fish, that a specimen was collected and eventually scientifically described. So far, it is known only from the Kii Peninsula, which sits roughly in the middle of Honshū, Japan’s largest island and Hachijojima, a small island south of Tokyo. No doubt, it can be expected to occur throughout the subtropical southern coastline of Japan, though it’s apparently quite the cryptic species for it to have remained hidden so long. 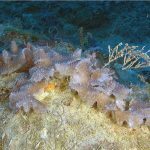 This species also seems to favor somewhat deeper water, having been recorded from a range of 18-45 meters. 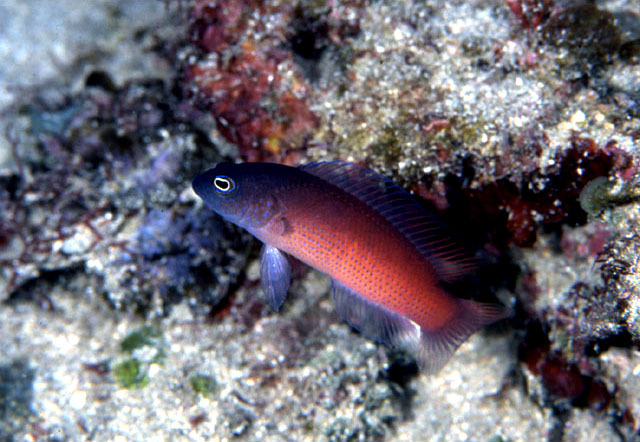 It’s not entirely clear who this dottyback is most closely related to. 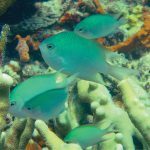 Some likely suspects include P. pylei, which occasionally finds its way into the aquarium trade, as well as more obscure fishes like the Yellowlip Dottyback, P. aurulentus, and the evocatively named Plain Dottyback, P. litus. 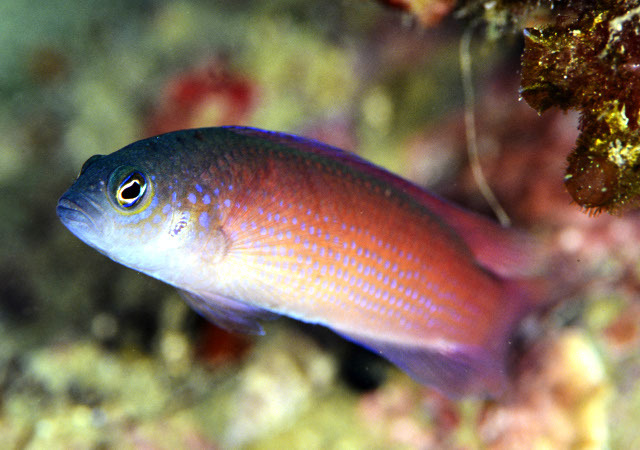 These do seem to resemble the Dottybelly Dottyback in general habitus, but there are enough morphological differences to make the matter unclear. 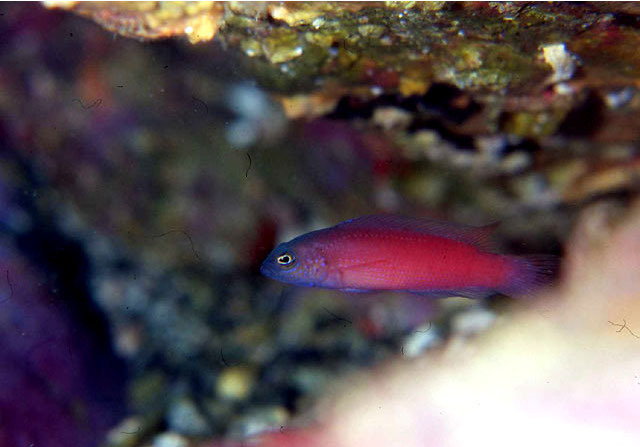 Interestingly, P. yamasakii is the only member of its genus entirely restricted to such a high latitude, as the other 70 species occur in warmer equatorial waters. Were it ever to be collected for the aquarium trade, it would likely fare best in somewhat cooler temperatures. 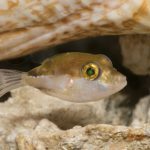 Of course, it’s unlikely it’ll ever be collected in large numbers (and even less likely that any of these would be exported outside the Japanese aquarium market), but perhaps someday this lovely little pseudochromid can be captive bred so that aquarists around the world are able to appreciate it up close. Unlike so many of its relatives, the Dottybelly Dottyback is actually kind of pleasant to look at, in its own understated way.